Street, San Francisco, Calif. 94105, has an- nounced the promotions of James P. Gray to the position of executive vice president- operations, and Marvin A. Griffin to group vice president-staff functions. February 15, said R.J. Pfeiffer, Matson pres- ident. Mr. Gray, formerly a senior vice president, headed the freight division and was presi- dent of the subsidiary Matson Terminals, Inc.
Matson Terminals, Inc., Matson Agencies and Matson's area managers. Mr. Griffin formerly was a vice president, corporate development. Reporting to him in his new position will be the heads of the finance division, law department, corporate development and industrial relations. Engine Division in Beloit, Wis., announced the $1.5-million order. The shipsets for the three vessels each include a Fairbanks Morse Model 38TD8-1/8 twelve-cylinder nonreversing marine engine with a vertical offset reverse and reduction gear. Each engine is rated at 3,000 horse- power at 750 rpm. Caribbean. The Equitable Shipyards are the world's largest builder of lighter aboard ship (LASH) and SEABEE barges. They also build tugboats, crewboats and supply vessels for the offshore oil industry. The Portland, Ore.-based Northwest Ma- rine Iron Works has started a 10-month overhaul of the USS Meyerkord under a $8.8-million contract. Stein including a sonar and dome. USS Meyerkord (FF-1058), U.S. Navy frigate, shown in Portland, Ore., Swan Island Ship Repair Yard for a regular overhaul by Northwest Marine Iron Works. November of 1978. The 478-foot-long vessel is in the same squadron as the USS Lang. Due to be installed on the Meyerkord are an improved communications system, radar, sonar unit and weapons, plus hull repair. Meyerkord will be housed by Northwest Ma- rine Iron Works for the duration of the job. Northwest Marine Iron Works' Marine Di- vision specializes in major vessel repairs, ship conversions and new barge construction. Atlas complies with U.S. Coast Guard rules for navigation recorders! U.S. Coast Guard rule effective June 1,1977 requiring all vessels of 1600 gross tons or more operating on the navigable waters of the U.S. to be equipped with 'an echo depth sounding device, a device that can continuously record the depth readings of the vessel's echo depth sounding device'. The Atlas navigation sounders ATLAS DIGIGRAPH 480 and ATLAS 460 fulfill this USCG requirement, and in addition comply with all IMCO recommendations. The ATLAS DIGIGRAPH 480 offers a unique range selection from 5 fins for shallow navigation and berthing, to 500 fins for deep water navigation. Operating ranges can be converted from fathoms to meters merely by pushing a button. On shallow ranges, bottom soundings from two transducers can be recorded simultaneously — (up to four transducers can be monitored in groups of two). The selected range and the bottom recording are digitally displayed, and an automatic 15 minute time mark and event marker features are included. Optional plug-in type transducers can be supplied for replacement without dry docking. 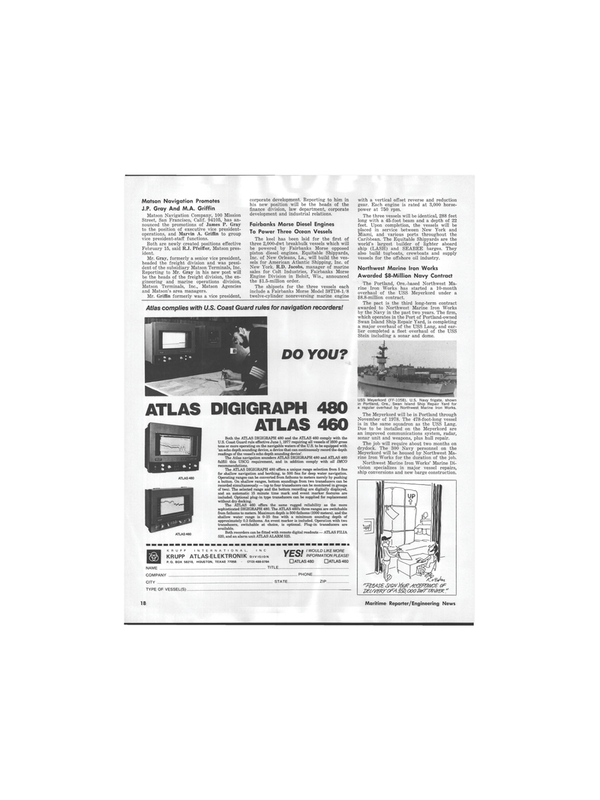 The ATLAS 460 offers the same rugged reliability as the more sophisticated DIGIGRAPH 480. The ATLAS 460's three ranges are switchable from fathoms to meters. Maximum depth is 500 fathoms (1000 meters), and the shallow water range is 0-25 fins with a minimum sounding depth of approximately 0.3 fathoms. An event marker is included. Operation with two transducers, switchable at choice, is optional. Plug-in transducers are available. Both recorders can be fitted with remote digital readouts — ATLAS FILIA 520, and an alarm unit ATLAS ALARM 525.